Olympus Mons. Viking Orbiter 1 color mosaic. Image: NASA and the Jet Propulsion Laboratory. Olympus Mons is the largest volcano on Mars and in the entire solar system. Olympus Mons is a shield volcano, the summit of which towers about 26 kilometers (16 miles) above the surrounding plain. This makes it roughly 3 times higher than Mount Everest. The largest volcano on Earth, Mauna Loa in Hawaii, rises a mere 15.2 kilometers (9.5 miles or 50,000 feet) above the seabed. Olympus Mons is 624 kilometers in diameter at the base, or as wide as the entire chain of Hawaiian islands. If placed on the state of Arizona, it would just about cover it. 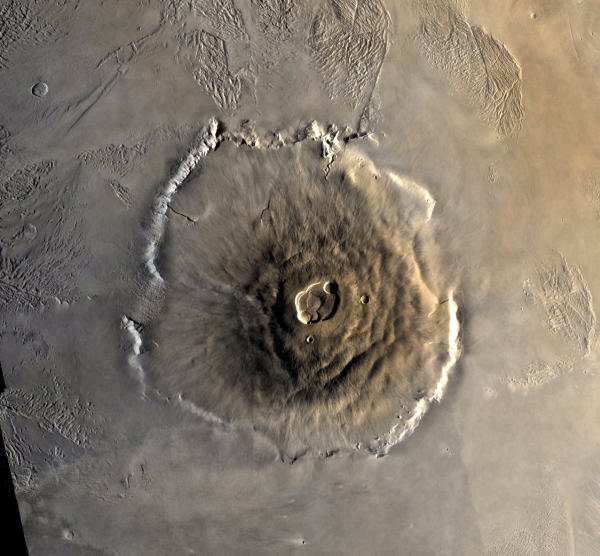 Olympus Mons has a central caldera 80 kilometers wide, with multiple circular, overlapping collapse craters that were created by separate volcanic events. The radial features on the slopes of the volcano were formed by overflowing lava and debris. Olympus Mons first erupted between one and two billion years. Some lava flows on its slopes appear quite fresh, but there's controversy over how long ago the volcano was last active. Estimates vary widely between 200 million years and as recently as one million years. Olympus Mons is found in the Tharsis Montes region near the Martian equator.